The PWA Slalom final in Noumea, New Caledonia is over. After six days and 6 completed eliminations Antoine Albau won the final World tour event in a close battle with Matteo Iachino in 2nd and Pierre Mortefon in 3rd. Albeau won his 24th world title. French Delphine Cousin Questel dominated the event and won the final tour stop. Sarah-Quita Offringa managed to finally win her 14th world title with an excellent 2nd place in Noumea. The level in both fleets is really high. Especially the ladies – a lot of young riders are competing – rose the level. Gonzalo Costa Hoevel won the foil boarding event in a clear lead in Noumea. Congratulations to the event winners and World title winners Sarah-Quita Offrinag and Antoine Albeau!!! Noumea, New Caledonia, is part of French Polynesia, located in the southwest Pacific Ocean – 750 miles east of Australia. New Caledonia boats the biggest lagoon in the world and has been listed as a UNESCO World Heritage Site since 2008, making New Caledonia a magnet for recreational boaters and ocean lovers alike, and provides the perfect, yet challenging, slalom conditions thanks to its trade winds, which usually blow anywhere between 10 and 30 knots. 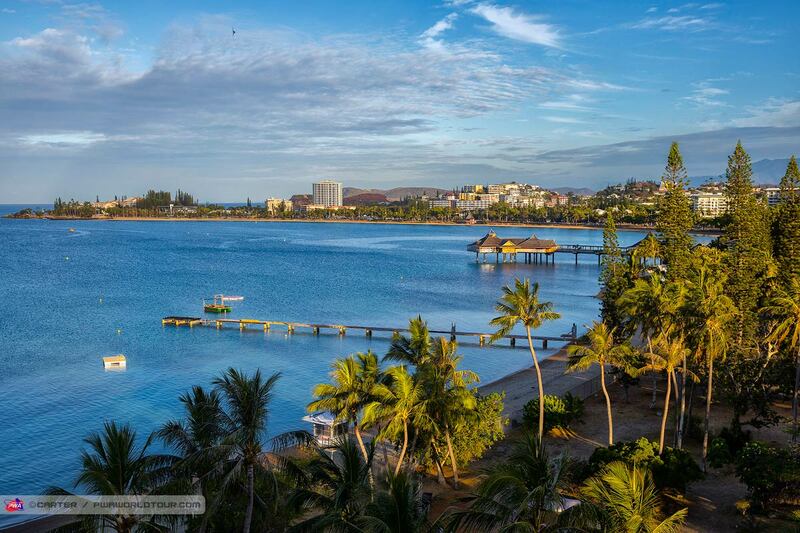 The lagoon spans an impressive 44,000km — with crystal clear waters dotted with islets, which has seen Noumea becoming renowned for its outstanding marine biodiversity. The competition takes place in Anse Vata from November 21st – 26th. Current tour leader Sarah-Quita Offringa – she won all three events – and Delphine Cousin Questel battle for the 2017 Slalom World title. At the moment Sarah-Quita is leading the ranking, but if Sarah-Quita finishes outside the top 3 and Delphine wins the event with a minimum of 4 eliminations, she will be the 2017 PWA Slalom champion. Strangely the Aruban got announced as 2017 Slalom World Champion in Denmark already, but a mistake in the calculations brought Delphine back in the title race. Sarah-Quita sailed tactically very well in New Caledonia against a very strong Delphine, who won teh event. The Aruban managed to finish in second place and won the title by 10 points difference. In the men’s category just three riders can seal the deal for the title. Antoine Albeau, the current tour leader, has the biggest title chances. Only Matteo Iachino and Ross Williams still have the chance to win the title. Antoine Albeau won the final event and as well the 2017 World title in the Slalom discipline! Matteo Iachino made it in 2nd in the event and 2nd in the overall ranking. Pierre Mortefon finished the event in 3rd place and jumped up in the overall ranking in 3rd place, too. Marion Mortefon finished 3rd and jumped up to third place overall. Turkish rider Lena Erdil suffered a foot injury and lost her podium in the event and in the overall ranking.